After attending my creativity workshop, a woman sent me an e-mail asking whether linear thinking was bad. I understand why she’d think so. 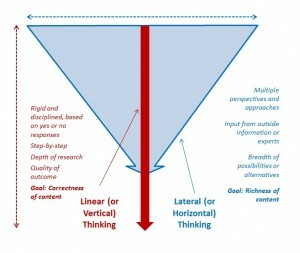 A quick Google search on linear thinking – or its counterpart lateral thinking – will uncover a number of articles and blog posts which declare that lateral thinking is preferable to linear thinking. And that’s true, if your goal was to generate the widest variety of options to solve a problem, or need multiple alternatives to an existing path. But it’s not the right path if your goal is a systematic, logical and singular answer. Neither Linear or Lateral Thinking is the right answer for every situation. They’re simply different ways to think, each having advantages and drawbacks. So, to answer the woman’s original question: Neither way to the wrong way to think, as long as you know when to use the right one. Linear Thinking is based on logic, rules and rationality (or sustained reason) to solve a problem. The thought process is singular: there is one path toward completion which ignores possibilities and alternatives. It’s methodical, sequential and focused. Each step is dependent upon a yes (correct) or no (not correct) option or solution. It’s easy to repeat, and to teach others. The process tends to be efficient, organized and completed on time. A person who uses Linear Thinking is constant. Not surprisingly, experts say this type of thinking accounts for 90% of our thinking each day – and no wonder. In a business situation, this type of behaviour is highly valued. In general, people who primarily use Linear Thinking are viewed as honest, maturity and intelligent. The person using Linear Thinking is selective, concentrated and automatic. Many professions rely heavily on Linear Thinking: solicitors, accountants, police, scientists, for example. The core of Lateral Thinking is to break from the established process to see the world – particularly the problem – from different and multiple perspectives. It ignores logic for unorthodox or random stimulation. A person using Lateral Thinking searches for as many alternative ways to view the problem, situation or environment – any one of which may produce a new and unusual answer … or as frequently not. The thought process of Lateral Thinking is not a straight line. A person using Lateral Thinking is more interested in the journey than the destination. The hallmarks of Lateral Thinking are discovery, exploration and spontaneity. It seeks disruption, rejects traditional, and explores unusual or illogical combinations. Outside influences are welcomes as much as fate, luck and chance. There are no mistakes, only an opportunity which didn’t work as hoped. But Lateral Thinking has drawbacks too. Because it’s based on chaos, there is no completion of the task. There is no objective because Lateral Thinking considers every source – including the inappropriate, illegal and idiotic – as equal. And, without objective, the person using Lateral Thinking may spin out of control, unable to find direction, or simply become paralyzed with too many options. If something brilliant is created (read: challenging the status quo), this provocative thinking is often repellent to, if not critical of, The Establishment. Think of Linear Thinking as driving a highway to your destination. It’s speedy, well-marked and easy to reach the destination. But what happens if something happens along the way, such as a major road block, construction or a traffic jam. Linear Thinking can’t progress. There is only one direction, so either the driver has to force their way through the blockage – which is highly unusual or unlikely, if not impossible – or they have to sit and wait. Conversely, drivers who use Lateral Thinking have no problem turning off, finding a different route, and enjoying the route. But it’ll take far more time, it’s much easier to get lost, and the focus is lost. The destination is not the goal, the journey is, so it’s quite possible the Lateral Driver will never show up. In short, the driver using Linear Thinking is be safe, keep your nose down, and let’s just get it done. The driver using Lateral Thinking is let’s go, let’s see what we can see, and if we get lost, so be it. Neither is a wrong approach, but you might see now that the driver who uses both Linear and Lateral Thinking, at the right times, will have the most efficient and most diverse drive. Perhaps too you can see the two types of thinking aren’t just opposite, they’re also complementary. They balance each other. 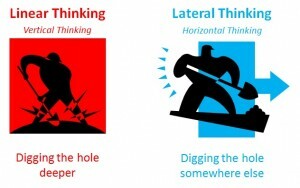 If the Linear Thinker couldn’t switch to Lateral Thinking, nothing would ever improve. If the Lateral Thinker couldn’t switch Linear Thinking, no new idea could be implemented. provide a brief guideline for a Vietnamese who is going to study in a country whose approach to thinking and writing is categorized by Robert Kaplan as ‘’linear’’? Can you give me a bit more information on what you are interested to know exactly? Is there a test for measuring linear thinking in general among university students? I’ve not heard of an assessment to measure linear thinking in anyone, much less university students. Why do you ask? if it opposite, I’ve found lateral thinking and thinkers to take the shortcut way thinking, fast nimble, jumping to conclusion without the bogged down details, linear thinking is thorough, detailed, methodical, painstakingly slow. Where linear thinking goes through the maze to get to the other side, lateral thinking just goes around the maze to get to the other side. I want to know some book about linear thinking theory, would you like to recommend? I honestly could not give you a book recommendation on Linear Thinking. However, you might consider Edward de Bono’s Lateral Thinking: Creativity Step by Step. deBono coined the phrase Lateral Thinking in this book, and as I remember, he discussed Linear Thinking as a way to define Lateral Thinking. Or, you might also look at Thinkertoys: A Handbook of Creative-Thinking Techniques by Michael Michalko. One of my favourite books (and I’m not a fan of business books by and large). He talks about Linear and Lateral Thinking as creative processes, as well as many other creative techniques. Links to both books on Amazon are below. Which book can I read to get the linear thinking theory? Ying/Yang… you need both. It just seems like our western culture seems to place more emphasis on conditioning and teaching the linear side, thereby conditioning more linear thinkers. However, when dealing with people, emotions, etc using the Spock “logical linear” alone has serious draw backs in a world where emotion: pain and pleasure or the way we feel moves things. Maybe we should stop trying to separate everything into neat compartments and realize how to be flexible in using both. Of course that might be “lateral thinking” of me to suggestion such an option. I will always choose linear thinking over lateral thinking. There should be an equal respect given to both linear and non linear thinkers. As a non linear thinker, I find that my linear friends are very quick to judge and dismiss my approach to life. They judge it as flaky , immature and time wasting. They have a very strong need to instruct, patronize and disqualify methods that differ from their own view. I appreciate the logic applied by linear thinkers. Sadly their very linear process does not allow them to show the same tolerance for my process. When I do accomplish the goals so set, they almost seem angry that it worked. Haha, there’s nothing like proving people wrong by doing something well. Until the world becomes more inclusive and accepting of differing opinions which aren’t destructive to others, stick to your guns. I agree absolutely. No one system or way of thinking works for every circumstance. To be most effective, you need to have an understanding of many tools, look at the situation with an open mind, and determine the best solution to solve the problem. More so, when you realise the way you chose isn’t correct, change and adapt and keep going. Thanks Thomas for your comment. I disagree. It’s like the people who say a person with lineal thought cannot multi-task – which is absolutely incorrect. Lineal though is very cumbersome because it is insanity, to look deeply into your area of study and if your yes/no hits a question mark, or hits a block you have to go back to square 1 again to reconstruct the entire logical process again. The thing with lineal thought for me – is that you are fully capable of multi-tasking and rapid thinking through lineal thought – but not simultaneously. It’s like running through 1 maze to the end; or partial & exit the 1st maze & then pick up on a 2nd maze, to the completion or partial; then off to a 3rd maze. If you take a mental note, or write down the process – makes going back over maze 1 and maze 2 quicker – in rapid sequence. The sequential pattern still exits; but, if organized – allows for multi-tasking. I worked in IT tech field analysis troubleshooting & my supervisor used to say I flipped screens repeated too much; but, that’s because of my brain thought process. Then we got macros to flip screens and post information. We’ll have to agree to disagree. I do not believe that the brain can multi-task effectively. There’s too much scientific research that suggests it cannot. I’m entering your thoughtful comment in my journal. I think that lateral thinkers can activate their mechanical mind and switch if the critical creative mind & do the vertical mechanical easy stuff. But it’s not easy for vertical thinkers to think in loops (horizintally) ponder and wander because they don’t value the journey and they don’t have the patience.They are all about the destination. This is true but leaves out an important piece: most people are Linear Thinkers and have difficulty thinking Laterally. If both were evenly distributed, I might say that both were equally important, but with Lateral Thinkers being so scarce… I believe Lateral Thinkers are more valuable. I totally agree with you. That’s true. If we want to make good decisions we should have a combination of linear and lateral thinking in our life. Actually, I feel that experts at a particular thing use Linear thinking at that specific thing. Take Real Estate for instance. I’ve talked and picked the brain’s of many wealthy and successful investors in my life, yet every one of them has a different strategy of investing. Rich flip investors oppose the rich buy and rent investors because they are comfortable with what they themselves deem as successful and they have no experience elsewhere. The same thing with great coaches and sports. Yet the universal rule is that there are just some things you cant coach that work. In acting, it’s all about what works for the sake of entertaining the audience. If you are a complete linear thinker, you probably have an obsessively unpractical way of viewing the world. Or you have a preoccupation for always being right. Typically during social discourse, I get into minor arguments with linear people. They are preoccupied with semantics; whether mac and cheese is still mac and cheese if it has meet in it. They just don’t understand a dreadfully good oxymoron. Sometimes they have trouble taking words with a grain of salt. I absolutely agree. The word “context” is key. Sometimes digging a deep hole is the right behaviour. Sometimes digging many holes to unearth different answers is the right behaviour. I also think of it this way: I shift from linear to lateral thinking when the answer in front of me isn’t working any longer, and I shift from lateral to linear thinking when I’ve found the best solution among many options. I believe there is no absolutely good liner or lateral thinking, with no reference to context. I personally know some liner thinkers who dig a deep hole that would be closed as manhole. A combination two, with right intention and in right direction must do wonders.